At 6793m Pissis is the third highest peak in the Andes. The mountain is in fact a chain of peaks, if you lower the criteria for re-ascent to 200m, there are as many as six 6000m summits in the Pissis chain. It was first climbed in 1937 and has received only twenty or thirty ascents since then. 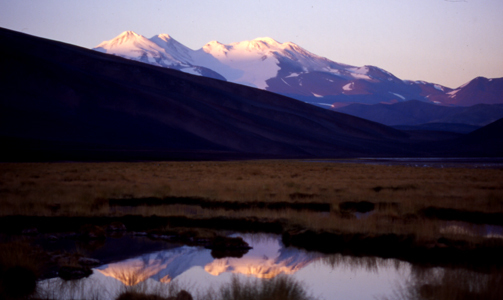 An 'Andes' group made the first British ascent in 1996 and we have been back three times since, successful every time. The normal route is from the north, approached from Catamarca and the village of Fiambala. 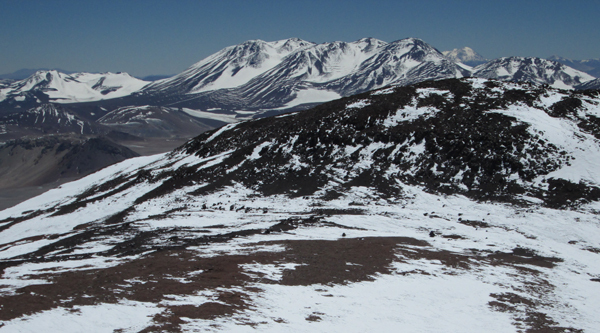 Looking north from the high camp on Pissis. We can organise guided ascents of this peak and guides, transport etc for private expeditions to Pissis. For details of how to climb Pissis and the neighbouring peaks of the Puna, please see our guidebooks, which are available in English, Spanish, Polish and French editions, direct from us or from all good bookshops and mountaineering shops. Pissis and the Salar de La Laguna Verde. The Pissis massif form the south.